The SBITC is a competition for teams of undergraduate and honours students now in its tenth year. The teams receive a number of problems and have to write the programs to solve the problems. They do not know the data that will be used to test their programs and incur heavy penalties for submitting incorrect answers. 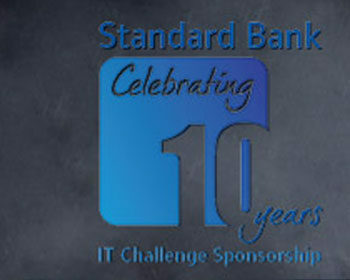 The Heats are run at universities and the Finals take place at the Standard Bank headquarters in Gauteng. This year the team of judges was more representative of different years than ever. All four judges had taken part in the Challenge before. Schalk-Willem Kruger was the backbone of the team from the North-West University for many years while Graham Manuell is a past member of the UCT team. Dr Bruce Merry and Jaco Cronje had been participants in the very first SBITC. For 2015 the rules were changed so that teams of up to three no longer needed to include a participant of both genders. Teams of four still needed to have members from both genders. Eleven universities entered. Some universities entered a large number of teams, not all of them actually took part. To give lecturers and students less time away from campus (at the request of lecturers!) the contestants were flown in on Sunday 23 August. The competition itself took part on Monday 24 August with the Awards Function the same evening. For the second time the Finals were held at the new “green” Standard Bank HQ in Rosebank, Johannesburg. One of the problems created by shifting the venue was that the judges’ room was at the end of a semi-circle of competitors’ rooms, necessitating a long walk – or run – for the furthest team. The rooms were therefore allocated by means of a double-blind random draw. Despite this, two teams found themselves in the same position as in 2014 – far from the judges. By happy coincidence the team that was the furthest from the judges was the team that won – for the second year running. It is extremely encouraging that no less than three Standard Bank staff teams took part. This increase can be attributed to staff member Melany Barnes who participated in past Challenges. It has become a tradition to introduce a surprise for every Final. For 2015 there were two surprises. The first surprise was that the first team to solve problem 3 would get a time bonus of one hour. The second surprise was that there were two questions (1 and 6) where participants had to solve part A before getting part B. The theme for 2015 was “Chicago in the thirties”. For most the evening ended at eleven. For some. a bit later. Questions answered: 6 out of 9 questions, with a bonus for winning the interactive game. The number 2, 3, 4 and 5 teams all solved 4 problems. When this happens the winning team is chosen on time. The timing is complicated because there is a penalty every time a team submits an incorrect solution. Nine university teams and three Standard Bank teams participated in the finals. A total of 94 submissions were made. Three teams used more than one language. A breakdown of the submission by language used shows that of the Python submissions, 13% were correct, while 28% of the Java submissions and 100% of the C++ submissions were correct.